The Kwajalein School System develops productive, successful and responsible students committed to academic excellence and lifelong learning. The Kwajalein School System was organized as a Navy Overseas Dependent School in 1956. Instruction was originally offered in grades one through eight. 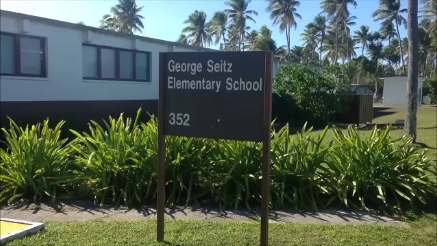 George Seitz Elementary School was named in memory of the first Commanding Officer of Kwajalein after World War II. In 1959, the school was converted from a Navy Dependent School to the present contractor operated system. In 1961, the system was expanded to provide for a kindergarten and a high school program. Kwajalein School System is accredited by the Northern Central Association of Schools, Commission on Accreditation and School Improvement, NCA/CASI, and AdvancEd. Kwajalein schools are highly academic, with strong emphasis on basic skills at the elementary level and on college prep at the secondary school. School is in session 180 days a year from late-August to early June. Classes are held Tuesday through Saturday. George Seitz Elementary School serves approximately 130 children kindergarten through the sixth grade. Most levels have one teacher with approximately 18 to 22 students. 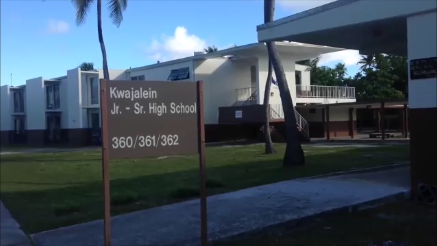 Kwajalein Junior/Senior High School serves approximately 129 students in grades 7 through 12. Students live on Kwajalein as well as the neighboring island of Ebeye. The students who live on Ebeye are part of the Ri-Katak student program. They ride a ferry to and from Kwajalein (approximately 25 minute boat ride) and then take a bus from the dock to school every day. We have a diverse group of students, many of them having lived in several different countries before coming to Kwajalein. Children must be five years old on or before September 1 to be eligible for enrollment in kindergarten. Any student who has successfully completed a recognized kindergarten program during the prior school year is eligible for enrollment in first grade. All children from age 6 to 18 must attend school unless they hold a valid certificate of graduation or are attending a home-school program approved by the Kwajalein School Superintendent. Textbooks and most instructional supplies are furnished by the schools. Foreign language instruction and upper level math begin in the junior high, culminating in AP offerings in Statistics and Calculus. Counseling services are available at both schools. Students have the opportunity to become involved in a comprehensive community athletic program, as well as a school intramural program. A full program of instrumental music is also offered. Students generally buy or rent their own musical instruments, although some are available through the schools. Private music lessons can be arranged. The high school offers a selection of clubs and activities to include National Honor Society, Student Government Association, French Club, Concert and Stage Band, 4-H Club, Marshall Islands Club, and Spirit organization. Kwajalein students consistently outperform stateside norms on the NWEA, SAT, ACT and other standardized tests. Kwajalein High School has had numerous National Merit Scholarship finalists and winners. The school system has also produced two Presidential Scholars in the last decade, as well as one Gates Millennial Scholar. On January 31, 1986, LTG John F. Wall, Commander, US Army Strategic Defense Command, sent a letter to President Amata Kabua of the Republic of the Marshall Islands stating that he was looking at the possibility of a scholarship program to permit several deserving Marshallese children from Ebeye access to the Kwajalein Schools System. A plan evolved out of this initiative to cooperate with the RMI in the selection of five Marshallese children from Ebeye to enroll in kindergarten at Kwajalein Schools in September 1986. Tuition is paid by the students' families. This program was originally called the Marshallese Program then later changed to the Guest Student Program. Beginning in September 1986, five children were selected to enter Kwajalein Schools kindergarten each year. Since 2012-13 school year, three kindergarten students have been selected into the Ri-Katak Program annually. A school lunch program was implemented in October 1988 for the Guest Students - provided by the Dining Facility with reimbursement by the RMI. School lunches are currently provided through the Dining Facility to these students through donations from the community. During the 2002-2003 school year, one of the High School Guest Students, Timothy Samuels, wrote an article in the High School Newsletter stating the name Guest Student Program did not identify these students properly as Kwajalein is the native land of the Marshallese. Also, the term "guest" suggested the program was free; however, the students' families were paying tuition. Timothy suggested changing the program name to Ri-Katak Student Program, meaning those who are learning, which better identifies the purpose of the program. Within the year, the name was officially changed to the Ri-Katak Student Program. For the 2016-17 school year Kwajalein Schools has 41 Ri-Katak students enrolled, 21 at the Elementary School and 20 at the Junior/Senior High School.